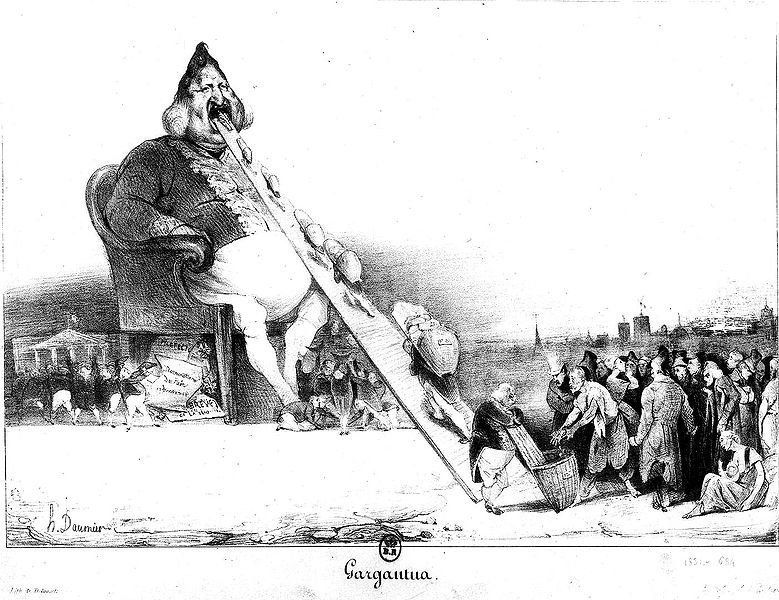 Honore Daumier has been called the "Michelangelo of Caricature. " Daumier was best known for caricaturing the government and after a stint in jail, he turned his attentions to the well-to-do of French society. His talent lay in expressing the character of a man through physical absurdity, employing the classic caricature technique of exaggerating the head and elongating the limbs. However, his satire was marked by a spirit of honesty. He was never overly cruel and didn't take on undeserving targets. Daumier executed his caricatures in the medium of lithography which allows for quick, sketchy images and often conveys a sense of movement in the work. Daumier's talent lay in capturing the unrehearsed moment. One critic described his works as "containing a raw energy, spontaneity and candor. " In many ways, lithograph artists such as Daumier who recorded daily life were the equivalent to the photographers of our modern era. 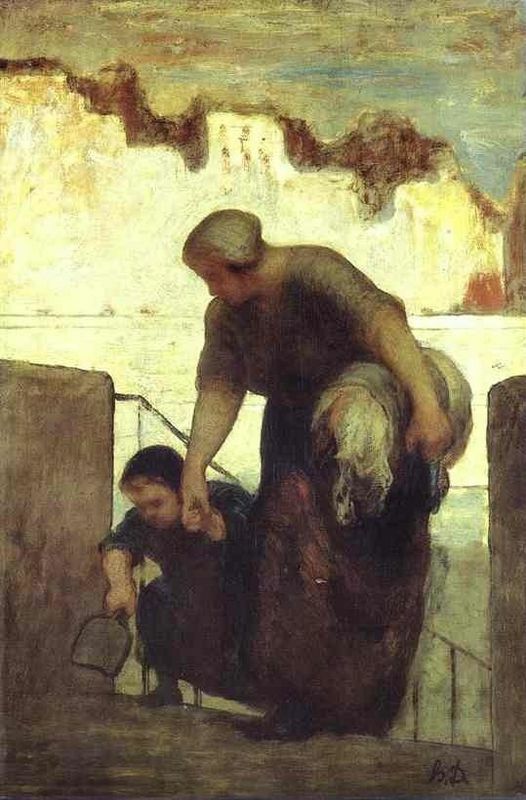 Daumier began painting relatively late in life. Like with his caricatures, he sought to get to the searing truth of the matter, although this time with much less satire. Some classify Daumier as a Realist, but he did not confine his painting solely to contemporary topics, which is what the Realist school of painting did. He painted the stark poverty of his country in paintings such as The Laundress, using everyday people to provoke a discussion about wider social issues. Rather Daumier's inclusion of historical subject matter makes him part of the Naturalist movement which was a reaction against the idealized and stylized paintings of the Romantic era. Like Realists, Naturalists were also about recording things as they are, but they paid more attention to getting the precise details just right. They also believed in man's futility against nature and some of Daumier's religious paintings suggest this. Daumier was also interested in exploring literary themes, in particular the ones contained in the popular novel Don Quixote, the fool who thinks he's a hero as he battles windmills. The numerous drawings and canvases he made of Don Quixote attest to his interest in the subject. 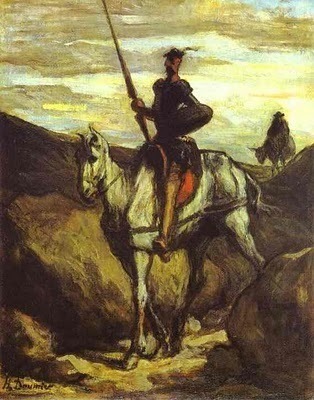 In particular, he liked to paint Don Quixote as a larger-than-life hero. Although sculpture was not a popular mode of artistic expression during Daumier's period, he had many sculptor friends and tried his hand at the craft. The sculptures were mainly done to give a life-like character to his lithographs, although some were carried out in terracotta or cast in bronze. Like his lithographs and paintings, they are remarkably spontaneous and life-like. In his work, Daumier depicts themes ranging from the history of France and Europe to political relations. His contemporaries were very complementary about his ability to capture the true spirit of his models. Daumier led the way with the Naturalist movement although his skills were not dully appreciated until the year before his death, 1878, when M. Durand-Ruel collected and displayed his works at his galleries.